Education is an essential key to human development. Being aware of this fact, I would like to pick up the education WordPress theme named Education WP by ThimPress into the review today. This WordPress theme released in December 2015. The review will not focus on detailing existing features of this education WordPress theme because you can easily find those on ThemeForest. However, the primary purpose is to show you excellent points and explain why should you choose this item for your education or learning management system but not other ones. The installation process of Education WP via WordPress with a .zip file is very smooth and quick without any bug. However, to avoid serious problems, necessary parameters of the system requires should be ensured beforehand such as execution time, memory limit, post size, upload file size. With the one-click importer, just in minutes, you will have the same demo launched. It is a great thing when the video tutorial on installation and demo data importation is included for easier follow of users. Coming closer to Education WP, you will be amazed at its trending, modern and attractive design. There are +07 pre-built homepages with different appearance and layouts for specific education purposes: first three demos for course hub or general online courses, 1 for one course, 1 for one instructor, one demo boxed and another one for RTL. This education WordPress theme is designed with the latest technology of HTML5 & CSS3. Besides that, it comes with unlimited color schemes in which some predefined color schemes are made and you can easily make your color scheme without any coding knowledge. There are thousands of fonts to help you create your typography to match your brand. The most important thing to make Education WP stand over other WordPress education themes is an improved UX/UI interface and pixel perfection with UX in mind. Just take one minute to look back to the demo, you will see how UX and UI care in this theme. The Ajax search bar is located in the menu to help you find live courses and blogs instantly, press UP or DOWN to select results or ESCAPE if you want to stop searching. In courses, main contents are divided into small tabs. Lessons and quizzes are popped up in the curriculum for convenience. For paid courses, when you decide to “Take the course”, just press this button and then you can quickly log in with your social accounts. Furthermore, the sidebar is sticky to ensure the permanent appearance of sidebar once the content part is too long. The footer is embedded with a fixed background video to bring the best UI. The support rooms of LearnPress are widely available on WordPress and ThemeForest with Elearning WP and Education WP to quickly solve inquiries and problems. More than that, users can recommend directly to developers features which need to develop via forums. Basing on these opinions, the plugin will frequently be updated. Just with this fact, you can see it different from other education WordPress themes which uses WooCommerce plugin or another 3rd party plugin to build courses: SenSei, LearnDash, CourseWave… because these plugins may cause heavy load to your site, you might have to pay additional payment to own a premium LMS plugin or depend on support from 3rd party for occurred problems due to updating or conflict. For LearnPress, all of those possibilities is not a deal because it is a lightweight core plugin which focuses on main features of a learning management system. If you prefer other additional options, then that will be the role of the add-on. All the free and premium add-ons of LearnPress are scalable and just plug & play to help your web server avoid from carrying additional resources. You can build courses quickly by drag & drop course builder. There are multiple question choices in quiz such as True/False, Multiple options, Single choice, Sorting Choice, Fill in Blank and more are coming. Have you ever asked yourself a question: What will happen if you change your existing Education WordPress theme? There is a high possibility to lose all your LMS data. 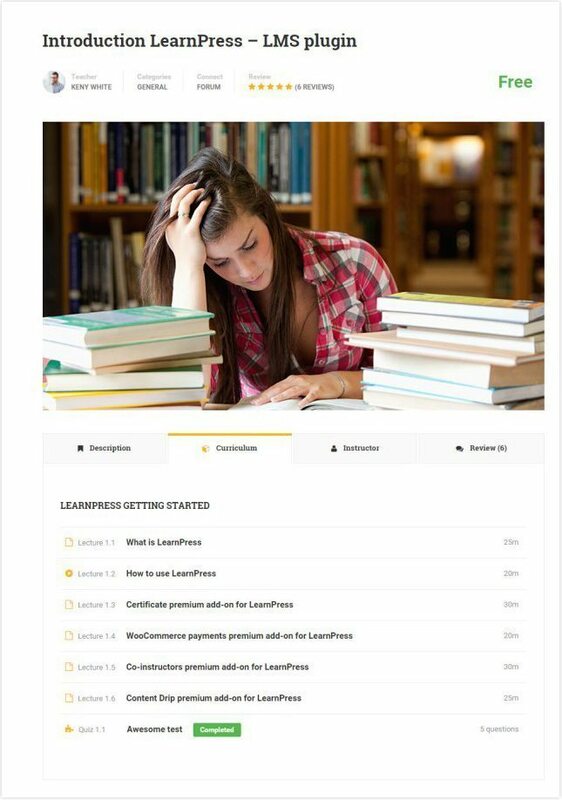 However, it is never a big headache for Education WP Theme and thanks to data portability feature of LearnPress. You prefer a more beautiful or modern theme, then switch to use because LearnPress will maintain all the data. 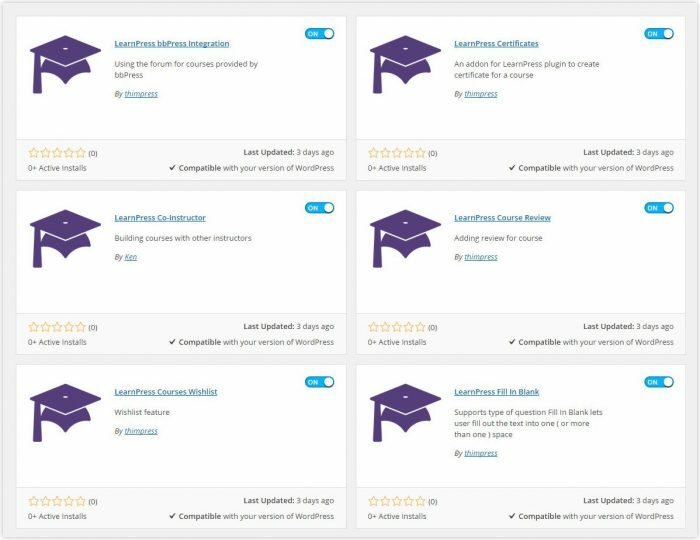 The effective way of free and paid courses in LearnPress is also an interesting thing for me because it is flexible with two options: either taking advantage of WooCommerce plugin or getting paid directly by Paypal, Stripe, 2Checkout without carrying a whole eCommerce system. This is another benefit you can find in Education WP because generally, other education WordPress themes only use the big eCommerce system just to process the payment for courses. Education WP uses SiteOrigin – the no. 1 drag & drop page builder on the official WordPress directory with more than 1 million active downloads to create any page and content with super ease. This plugin is lightweight to reduce the load on your site and simple to use even for newbies. It is also a unique feature of Education WP because other developers prefer Visual Composer in this case. However, this premium page builder plugin often uses blocks, elements and shortcodes which require more complex technical knowledge. To customize the look and feel of your site quickly, the WordPress Native Customizer is integrated seamlessly into education WordPress theme. From here, you can configure all the settings: header, footer, styling, display, typography, etc. Microdata is implemented, blogs, posts and courses are optimized from the title, heading tags, meta…to make sure your site will appear on the top of search results. It is enhanced by the fully responsive feature of the theme which gives the perfect look of your website on any device and brings more traffic, help learning and selling courses easier. To optimize the performance of the site, there is a broad range of things implemented here. Script and style requests from plugins such as WooCommerce, Contact Form 7, Mail Chimp, LearnPress, LearnPress add-ons are reduced minimum to improve loading speed. More than that, some modern technologies for improving the website are also used in this education WordPress theme like: minify CSS, minify js, remove query scripts. Images are maximum compressed by the Smushit plugin. To optimize the performance of the site, there is a broad range of things implemented here. Script and style requests from plugins such as WooCommerce, Contact Form 7, Mail Chimp, LearnPress, LearnPress add-ons are reduced minimum to improve loading speed. More than that, some modern technologies for improving the website are also used in this education WordPress theme like: minify CSS, minify js, remove query scripts. Images are maximum compressed by the Smushit plugin. More than that, some modern technologies for improving the website are also used in this education WordPress theme like: minify CSS, minify js, remove query scripts. Images are maximum compressed by the Smushit plugin. The last great thing to classify Education WP be the best among other WordPress education themes is its regular updates and compatibility with the latest WP versions. This shows the hard working of the development team to give the best things to you. Although features of membership, commission, front end editor for course builder have not yet been built, ThimPress developers stated that they would soon release them in very short time. Of course, I will keep you updated with this post. 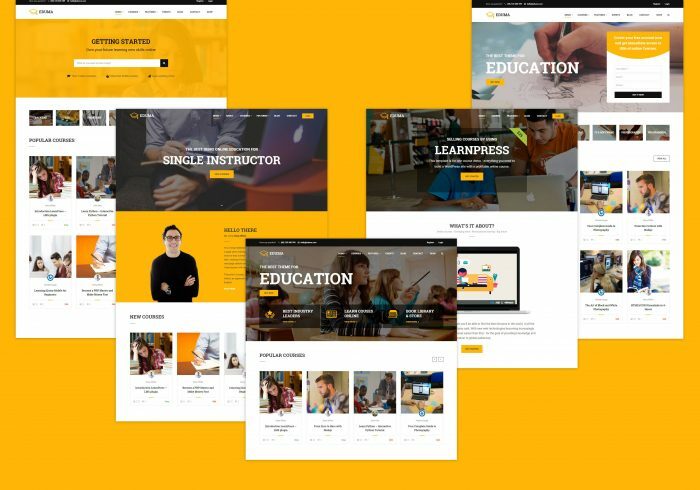 And now, what you should do is going to ThemeForest to visit the demo and download this awesome education WordPress theme for your education and learning management system.